They called it Black Sunday. 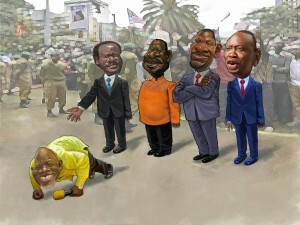 The 10th of June they said, would forever be remembered as one the darkest days in Kenyan history. Four years before to the day, two senior government officials died in an aircraft accident that was strikingly similar to the helicopter crash that had just killed two more, as they flew over the scenic Ngong Hills that fateful Sunday morning. Media stations played and re-played footage of Hon. George Saitoti giving a speech that turned out to be his swan song, wherein he made a passionate appeal for a peaceful election. His assistant Orwa Ojodeh was hailed as a man who was gifted in building bridges across the political divide. Indeed, he was a self-confessed “Mr Fix-It for both friend and foe”. In death, the two politicians became almost saintly. Messages of condolence flooded the social media as Kenyans struggled to absorb the news – and explain it. Conspiracy theories abounded in the immediate aftermath. Many were of the opinion that being an election year, the parched ground was ready for fresh blood. Sacrifices, they said, had to be made as the jostling for power began in earnest. Memories of the Kones/Laboso crash in 2008 cemented the theory in hearts and minds, as the nation searched desperately to find meaning in the tragedy that also claimed the lives of police pilots Luke Oyugi and Nancy Gituanja, and bodyguards Joshua Tonkei and Thomas Murimi. Writing for the Sunday Nation in an article titled, Does June 10 date bear a jinx tag? Samuel Siringi examined the eerie coincidence. “Prof Saitoti and Mr Ojodeh become the second pair of lawmakers in the 10th Parliament to die in an air crash after Mr Kones and Ms Laboso. That they all happened during President Kibaki’s regime is a sense of personal loss to the Head of State. The death of Prof Saitoti and Mr Ojodeh also rekindles memories of three other plane crashes in 2003, 2006 and 2008 that claimed the lives of senior government officials,” he wrote. Whichever way one may choose to interpret the events of 10 June 2012, it is indeed oddly coincidental that a freakishly similar incident happened on the exact same date, in the same area, fours years before. What meaning may be drawn from both remains unclear, as one might be forced to sacrifice logic for intuition. Something that the modern Africans finds himself reluctant to do, despite a persisting belief in all things spiritual. But being African, one thing we will not do is speak ill of the dead. Conversely, it is a continental pastime to speak ill of our politicians while they are alive. We call them out for their robbery of public coffers, relentless and ruthless pursuit of power, endless deceptions and even for hatching murderous plots to ‘finish’ their enemies. When it comes to the men and women for whom politics is a profession, we are a no-holds-barred society and will call them every name in the book. But as soon as they pass away, it is as if we forget who they were and what we thought of them. It is as if death erases the record of sin. This is why it was shocking (perhaps even suspicious) to see some Libyans celebrating the death of Gaddafi so openly, more so the disgraceful manner in which he was killed. Africans – even those of Arab descent – do not dance on people’s graves. At least not in public. Which is all well and good. But we need to refrain from heaping praise on the dead just because they are dead. There is a difference between genuine concern and empathy for those left behind and outright duplicity. A respectful silence should be kept by those who came out publicly to cast aspersions on the character of the deceased, which in this case amounts to a good proportion of the population. But some did even worse. It’s unsettling to watch Mr Daniel arap Moi condoling with the family and claiming that he was part of the team that was pushing for Hon. Saitoti’s 2013 election bid, given the betrayal of 2002, when he snubbed his then vice-president for Project Uhuru. If it were not so tragic, it would be funny. Then again, politicians are in the unique circumstance wherein they are almost exclusively defined by the sins of the collective, whether they subscribe to the philosophy of the group or not. The consequence of this being that they are all deemed guilty even in the absence of a crime. Even so, we have been socialised to worship at their feet, adoring and resenting them in equal measure. When they die, our sycophantic behaviour turns hypocritical. But whatever the case, may God bless the dead. And may the citizens of Kenya hold their peace.